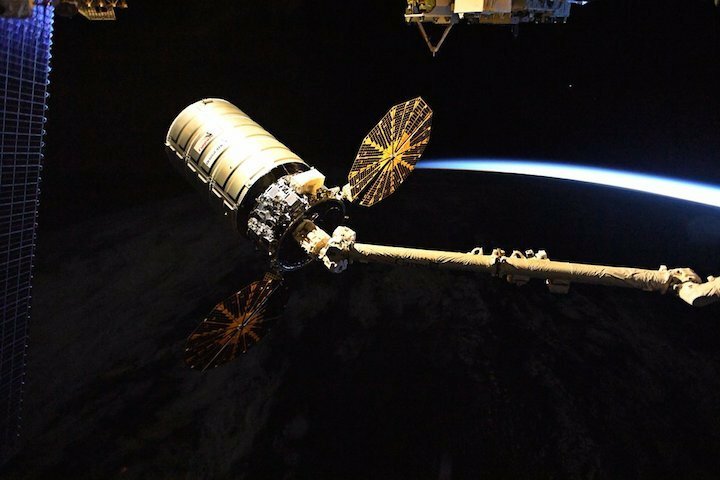 The Orbital ATK Cygnus resupply ship approached the International Space Station on its eighth resupply mission as both spacecraft flew into an orbital sunrise. 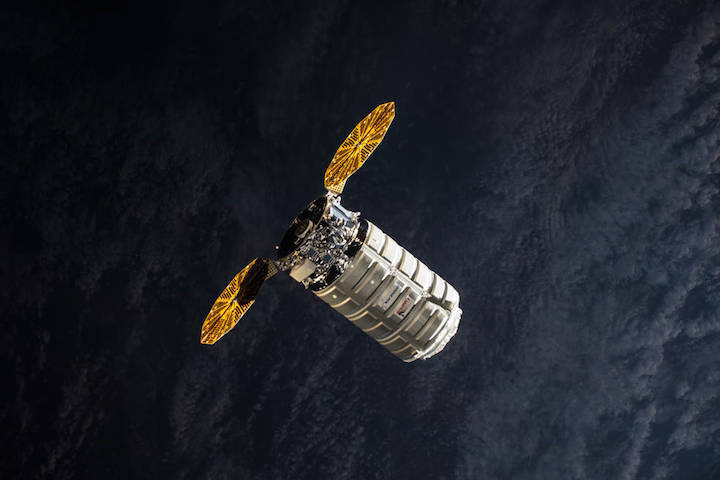 After delivering almost 7,400 pounds of cargo to support dozens of science experiments from around the world, the Orbital ATK Cygnuscargo spacecraft is set to leave the International Space Station on Wednesday, Dec. 6. NASA Television and the agency’s website will provide live coverage of Cygnus' departure beginning at 7:45 a.m. EST. On Tuesday, Dec. 5, ground controllers will use the Canadarm2 robotic arm to detach the Cygnus spacecraft from the Earth-facing side of the station's Unity module. The spacecraft, which arrived at the station Nov. 14, will be maneuvered above the Harmony module to gather data that will aid in rendezvous and docking operations for future U.S. commercial crew vehicles arriving for a linkup to Harmony’s international docking adapters. The maneuver will not be televised. On Wednesday, Dec. 6, at approximately 8:10 a.m., Expedition 53 Flight Engineers Mark Vande Hei and Joe Acaba of NASA will give the command to release Cygnus. Cygnus is packed with more than 5,500 pounds of trash and other items marked for disposal. Experiments delivered on Cygnus supported NASA and other research investigations during Expedition 53, including studies in biology, biotechnology, physical science and Earth science -- research that improves life on Earth. Investigations included studies on communication and navigation, microbiology, animal biology and plant biology. Cygnus also will release 14 CubeSats from an external NanoRacks deployer on Dec. 7. The craft will remain in orbit until Monday, Dec. 18, when its engines will fire twice, pushing it into Earth's atmosphere, where it will burn up over the Pacific Ocean. NASA TV will not provide live coverage of these events. The Cygnus launched Nov. 12 on Orbital ATK’s upgraded Antares 230 rocket from NASA’s Wallops Flight Facility in Virginia for the company’s eighth NASA-contracted commercial resupply mission. 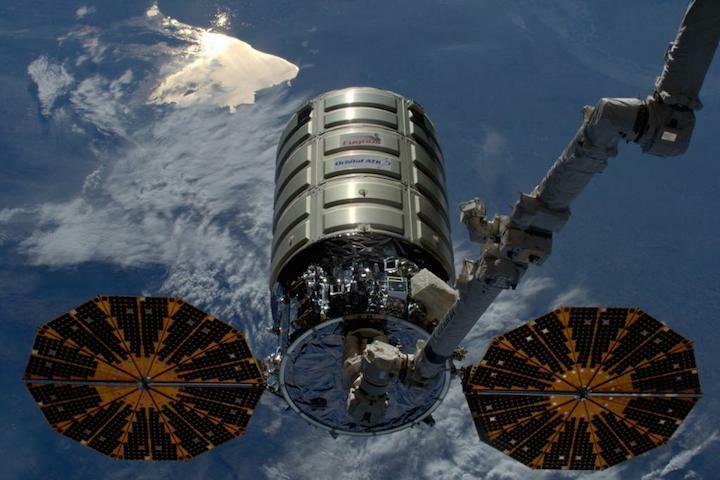 After delivering almost 7,400 pounds of cargo to support dozens of science experiments from around the world, the Orbital ATK Cygnuscargo spacecraft has departed the International Space Station. 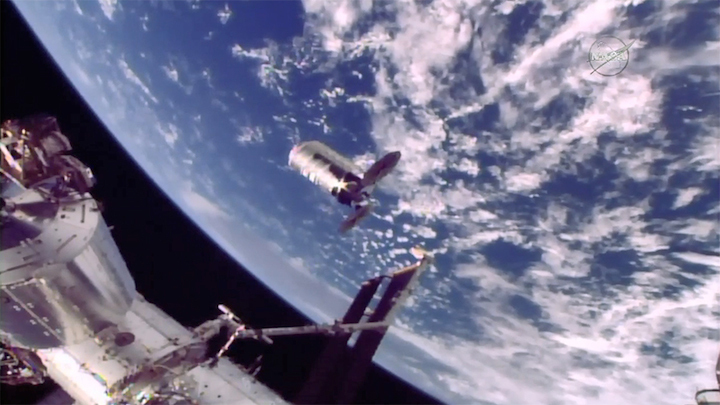 At 8:11 a.m., Expedition 53 Flight Engineers Mark Vande Hei and Joe Acaba of NASA gave the command to release Cygnus. On Tuesday, Dec. 5, ground controllers used the Canadarm2 robotic arm to detach the Cygnus spacecraft from the Earth-facing side of the station’s Unity module. The spacecraft, which arrived at the station Nov. 14, then maneuvered above the Harmony module to gather data overnight that will aid in rendezvous and docking operations for future U.S. commercial crew vehicles arriving for a linkup to Harmony’s international docking adapters. Experiments delivered on Cygnus supported NASA and other research investigations during Expedition 53, including studies in biology, biotechnology, physical science and Earth science. Later today, Cygnus will release 14 CubeSats from an external NanoRacks deployer. Cygnus also is packed with more than 6,200 pounds of trash and other items marked for disposal during its destructive reentry Monday, Dec. 18.